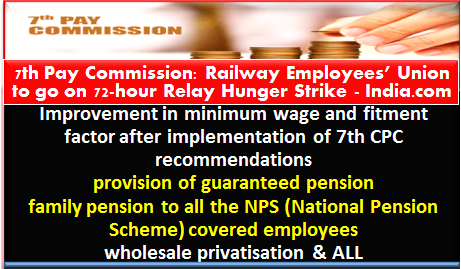 New Delhi: Railway employees’ union has called for a 72-hour relay hunger strike across the country from today against non-implementation of the provisions of the seventh pay commission and the attempted privatisation of the national transporter. A statement from the All India Railwaymen’s Federation (AIRF) said on Monday that despite several meetings of the AIRF with leaders of the central government organisations and Home Minister, Finance Minister, Railway Minister and Minister of State for Railways, no decision has been taken yet. AIRF in its meetings decided to stage a ‘Mass Relay Hunger Strike’ for 24 hours for three consecutive days. “Despite requests to the government of India to consider the demands of the Central Government Employees — Improvement in minimum wage and fitment factor after implementation of 7th CPC recommendations, provision of guaranteed pension and family pension to all the NPS (National Pension Scheme) covered employees, irrespective of their date of appointment…contractorisation leading towards wholesale privatisation, no fruitful outcome has emerged as yet despite lapse of around two years’ precious time,” the statement said. AIRF in its meetings of the General Council and Working Committee held on March 13-14, 2018, here decided to stage a ‘Mass Relay Hunger Strike’ for 24 hours for three consecutive days — at all the branches of the affiliated unions of the federation all over India. “All the branches of AIRF affiliates are, therefore, going to stage the aforesaid ‘Relay Hunger Strike’ from the morning of May 8, all over the Indian Railways”, wherein large-number of railwaymen would sit on the relay hunger strike to press on their above-mentioned major demands, the statement said.